← Oh joy—existentialism. No, seriously. Last spring, I caught sight of this old man making his way home with a bit of scavenged firewood. I imagine he’s using it now. The wind is so cold. And so fierce when it whips up. An hour ago the sky was black and the beams were creaking. Now it’s serene. Not a cloud in sight, except for those harmless stragglers, skidding like dust bunnies before a brilliant moon. The smell of smoke is in the air. The wind pulls it out of the chimneys, sideways. Some of it is his. 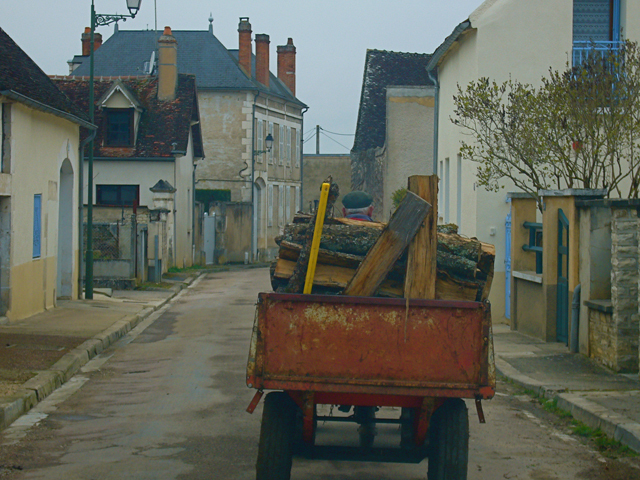 This entry was posted in AROUND US, FRANCE and tagged Burgundy, firewood, France, old man, wind. Bookmark the permalink. So, so beautiful. What sign is there of the 21st century in this picture? Only the rubber tires on the truck? The barely visible lower half of an aerial attached to a chimney? A tiny segment of two wires strung on a power pole in the distance? These photographs bring tears to my eyes: They take me back to my high school French teacher in Roanoke, Virginia–Henriette Messager Fallwell–the French “war bride” of a U.S. soldier who served in France during World War I, the finest teacher I ever had in all my schooling, and the reason why I majored in French in college and encouraged you to go to Europe when the opportunity came. Vive la France! I think of Madame Falwell all the time. She did have in impact on my life in a strange way. Things don’t finish with one generation. They ripple like waves in a pond—out and out and out. I love your observations about what is modern in the image. You’re right, too…the signs are few compared to what’s all around them. Beautiful. Love the light blue and the red highlights.